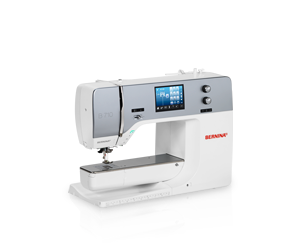 The BERNINA 710 includes a meticulously-engineered extra-long freearm with ten inches / 254 mm of space to the right of the needle. The BERNINA 720 makes sewing dreams come true The BERNINA 720 won over Swiss designer Mathias Ackermann right from the start: "Working with a BERNINA has an inspirational effect on my designs. I love working with the BERNINA 720, and not just because of its well-engineered technology. Features such as the threader and the BERNINA Stitch Regulator thrill me to bits. What’s more, its versatility inspires me with new ideas, and its user-friendliness is simply brilliant. It also sews the finest fabrics, effortlessly."